A soft dusting of cocoa. A slight resistance as my teeth break through the shell, before the richness of chocolate with a hint of espresso floods my mouth, along with the smooth melting of ganache. This is the experience of biting into one of Ivan’s Truffles, the handmade artisan chocolates created by Ivan Loubier-Cote. It is a little bite of chocolate heaven. 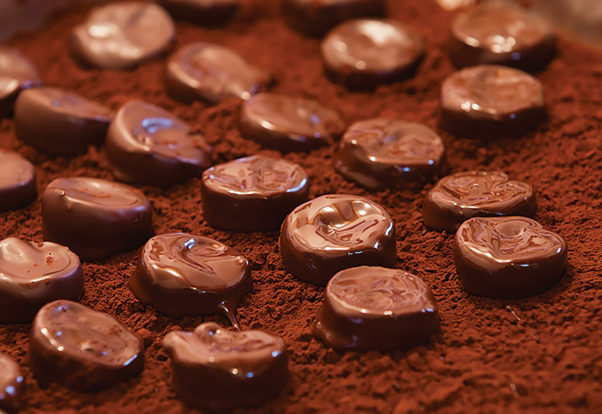 It’s a heart-warming idea—an entire batch of truffles created with love for an individual. For example, the espresso truffles I just tasted were created for his great uncle. “He’s such a classy dude,” says Loubier-Cote, “really ridiculous, over the top, and so lovable. The biggest personality I’ve ever met. Just picturing him sipping his espresso—that’s what I want people to taste. That classy, lovable dude who is just loving his espresso so much. Loubier-Cote’s love and passion for food began nearly 20 years ago in Ottawa. Born in the Ottawa Valley, he moved to Toronto in early 2000 to attend a two year culinary management course. There he met Master Chef Didier Leroy, who was a guest chef at the college and one of only two Master French chefs in English-speaking Canada. “I really resonated with his philosophy of cooking,” says Loubier-Cote, “and his food was… I’ve never seen food like that before—it was unparalleled. “I like to call him a part-time Buddhist,” adds Loubier-Cote, who says the chef’s approach was often Buddhist in nature. “He taught me a lot about discipline, which I needed, and it taught me to zone out from the pressure and stress of a job—any job—but to give the attention to the thought of what was in my head. The philosophy taught me not to succumb, not to think, and in its place I’d be focusing on every detail.” Specifically, every detail of the person he was thinking about as he created his dishes. Loubier-Cote built a successful career, with his first head chef position being at Taboo Muskoka Resort. He received many accolades, plenty of press coverage, and was well respected in the industry. But after 12 years of a very successful career, he “divorced the kitchen and moved west—mostly to escape the city,” and the hot kitchen. At first he wasn’t sure what he wanted to do, so he took an entrepreneurial course at the community college in Vancouver, the main purpose of the course being to open a business for under $5,000. His transition into chocolate really occurred here. Loubier-Cote already had a lot of experience with fine food, flavor pairings, and finesse of details. After visiting friends in the Comox Valley and loving the area, he relocated and serendipitously was offered a job at the Atlas Café (front of house this time). He decided to try the truffles out here. 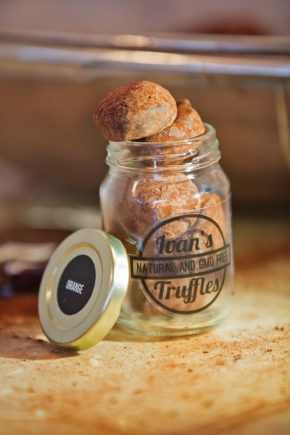 Ivan’s Truffles are handmade using organic cream, pure Valrhona chocolate, and organic teas, flowers and fruits. They are always GMO-free, gluten-free, and nut-free, and he uses locally sourced ingredients whenever possible. He also makes a dairy-free truffle for those who are dairy free but still desire the experience. Loubier-Cote is currently making five batches of truffles a week, each batch making 100 pieces. He varies the flavor depending on season, and his own creative impulses. “The newest chocolate—which I’ve never seen anything like—is Kaffir Lime and Mosaic Hops. It’s interesting—tropical fruit and grassy and floral. And it finishes just like an IPA. It’s a funny one. I love seeing people reacting. I’ll ask them at the market, ‘Do you like beer? Because it’s really for beer lovers. Loubier-Cote goes on to explain the reason why you never quite know what truffles will be available from him. “I don’t want to design a line of chocolates and stick to that.” He reasons that people want what they want because they can have it, and that businesses just offer everything they can hoping to make customers happy. He acknowledges that “of course people want their favorite chocolate,” but if it is unavailable then they will branch out and try something new. It is his way of keeping the chocolates fresh, both as a food item and as an experience. 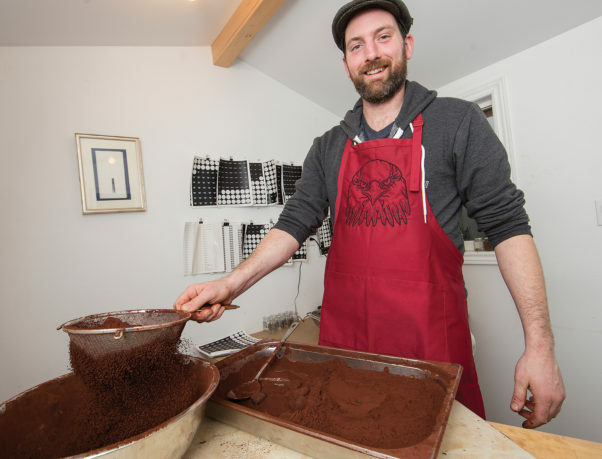 He is passionate about the process of creating his truffles too. “There’s so much I like about it,” he says, smiling. “I start with the ganache. I use organic cream and whatever flavor I’m using—I steep that.” After creating the ganache he adds honey, cures it, and then tempers the chocolate. But while he is explaining the technical steps, one can imagine a whole other level of what he is doing—add a splash of brilliance, fold in cherished thoughts, cure with intention, and temper with a whole lot of cultivated love. He speaks of melting the chocolate for 12 hours at a specific (secret) temperature, working individual portions on marble to bring down the temperature, then combining the warm and the cooler ganaches. “The temperature is very important,” he says. “It must be exact at all these stages. He then hand-coats each piece with a chocolate shell, a process known as enrobing that is typical of European truffles. “I kind of like that romance, too,” he says. “Each one has been touched and each one is slightly different because of that. And splashing it into the bowl of cocoa is nice too. The smell, even how messy it is—is satisfying in a weird way. “My biggest enjoyment [is knowing that people] are experiencing something that I created,” Loubier-Cote says. A little hand-made gift meant to make you respond to the simple and beautiful aspects of life, love and people. Loubier-Cote would like to let the business grow as big as it can without the product losing its integrity, and eventually envisions finding a retail space. Here he could teach courses, offer demonstrations, host private functions, and have wine pairings. Currently, Loubier-Cote is holding a contest to reuse his truffle jars in a creative way as the blue bin will not take glass. The winner will be gifted one jar of truffles every two weeks for all of next year. The contest runs until December 31, 2016.